©2014 by Blackstone Audio, Inc. Shortly after breakfast on a false spring day in the winter of 1865, Abraham Lincoln slipped out of the White House alone and into a waiting carriage. To deceive passersby, his Irish-born valet, carpetbag in hand, lagged a minute or two behind him. A train with a single car had been summoned to take him to Annapolis, where the fastest ship on Chesapeake Bay would be ready to run him south to Hampton Roads, Virginia for a peaceful talk with the enemy in the midst of a shooting war. It had never happened before. It has never happened since. Apart from his Secretary of State, who had quietly gone ahead of him, neither his Cabinet nor his staff had been told that he was going. After nearly four years of war, over 600,000 young Americans were dead, the battered Rebel armies were cornered, and the rebellion was nearly broken, but no one knew when it would end. A federal push to victory would kill tens of thousands more, humiliate the South, and delay for generations what Lincoln wanted most -- a reunited nation healed of its painful wounds. Reasonable men on both sides were coming to Hampton Roads in search of a way out. Abraham Lincoln. Photo taken on Sunday, February 5, 1865, two days after the peace conference. As Lincoln headed south, three Rebel peace envoys were on their way to meet him in Ulysses S. Grant’s dispatch boat. Evading his orders and exceeding his authority, Grant had passed them through his siege line to the cheers of the combatants on both sides and convinced the embattled President (using fair means and foul) that the three Southern doves were prepared to accept his surprising terms for peace. On the other side of Grant’s siege line, Robert E. Lee was praying for their success and Jefferson Davis was plotting their failure. Under pressure from his left to accept Lincoln’s invitation to negotiate the restoration of “our one common country,” the defiant Confederate president had chosen as his spokesmen three leaders of Richmond’s growing peace movement and given them a mandate to bring peace to “two countries,” expecting them to fail and incite the Southern people to a war of desperation. To avert a pointless death struggle, the President of the United States and the men in Grant’s dispatch boat would have to square that circle. It was Francis Preston Blair, the Southern-born patriarch of Blair House, a friend and collaborator of the late Andrew Jackson’s, a confidant of Abraham Lincoln’s, and a father figure to Jefferson Davis, who had set it all in motion with an audacious scheme to combine Grant’s army with Lee’s and attack a foreign foe as a glorious path to reunion. In a month of shuttle diplomacy, Blair had restored old friendships in Richmond and persuaded Jeff Davis to endorse the idea. 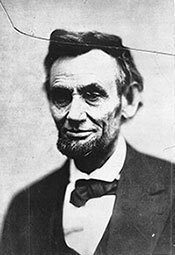 With Washington full of intrigue over an imminent vote in Congress on a Constitutional Amendment banning slavery, Lincoln agreed to the peace talks surreptitiously, misleading pro-Southern Democrats and enraging the Republican right. On February 3, 1865, Lincoln and his charming Secretary of State, William Seward, sat down with Davis’s emissaries on the paddle-wheeler River Queen, the Air Force One of its day. It was a gathering of old friends. 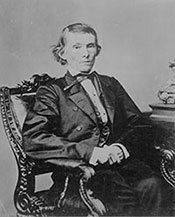 Davis’s eccentric Vice President, Alexander Hamilton Stephens, led the Southern delegation. Weighing less than 100 pounds, “Little Alec” had been Lincoln’s ally in the Congress of 1848 in a movement to end the Mexican War. 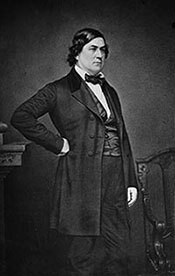 The aristocratic Senator Robert M. T. Hunter of Virginia had been Seward’s friend and colleague in the old Senate. The third Rebel negotiator, the brilliant Alabamian John A. Campbell, a former Justice of the United States Supreme Court, now the Confederacy’s Assistant Secretary of War, had worked hard with Seward to stop the fighting before it started. Their reunion at Hampton Roads began in a glow of nostalgia, descended into threats, and ended with a glimpse of Lincoln’s startling compromise, which was sure to enrage his own party. With a prologue drawn from vivid accounts of the suffering on the battlefield and the jubilation that greeted the Rebel peacemakers when they crossed the Union lines, Our One Common Country is a character-driven story, never told at book length before, meticulously researched in the primary sources. In captivating detail, it explores the peace conference’s origins, its failure, and its aftermath, including Lincoln’s alliance with Stephens in the old House; Seward’s friendship with Davis in the old Senate; Blair’s wartime maneuverings in Richmond with the leaders of the Southern peace movement; Secretary of War Edwin Stanton’s attempts to sabotage the peace talks; the outrage they provoked in Congress and in Lincoln’s own cabinet; the Northern leaders’ moving conversations with their old Southern friends on the River Queen; Grant’s surreptitious efforts to negotiate peace with Lee and evade Stanton’s efforts to derail them; and Lincoln’s poignant search for a path to reconciliation in the smoking ruins of Richmond after the peace conference failed. Shedding new light on Lincoln, Davis, the powerful men and influential women around them, the tragedy of the Civil War, and its meaning for the intractable political wars of our own troubled times, Our One Common Country tells the fascinating story of how Lincoln and his contemporaries tried to break the political logjams in Washington and Richmond, find a peaceful compromise, save tens of thousands of lives, and change American history. "Not surprisingly, much of the interest in 2014 has turned to the close of the war and its unhappy aftermath in Reconstruction. 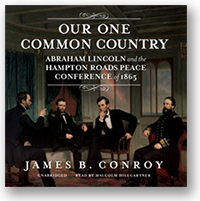 James Conroy's "Our One Common Country" (Lyons Press, 416 pages, $27.95) is a page-turner about Abraham Lincoln's struggle, in the face of opposition from his own administration and from a delusional Confederate leadership, to bring the Civil War to a negotiated conclusion in February 1865, before more lives and treasure were squandered. The Hampton Roads Conference formed the backdrop to Steven Spielberg's 'Lincoln'" The heartbreak of the conference's failure almost makes you yearn for a 'Lincoln' sequel." - Allen Guelzo, author of Gettysburg: The Last Invasion. 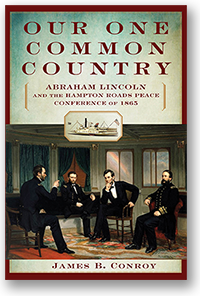 "A brilliant account of the doomed effort to end the Civil War through diplomacy. In February 1865 three "commissioners," all prominent members of the Confederate government, met with Abraham Lincoln and Secretary of State William Seward on a riverboat near Hampton Roads, Va., to explore the possibility of a negotiated end to the Civil War, an event briefly portrayed in the recent film Lincoln. The project appeared hopeless from the start; schemes were launched to derail the conference before it could begin, deftly defeated by further chicanery on the parts of the commissioners and Ulysses Grant. Legal and political difficulties beset the conference as well, given the commissioners' lack of authority to conclude an agreement, Jefferson Davis' claim that he had no authority to dissolve the Confederacy, and Lincoln's refusal to recognize the existence of a separate government in Richmond. In this excellent debut, Boston-based attorney Conroy vividly captures the hope, weariness, despair and anger of the moment and the complexity of feelings on both sides. Everyone yearned for peace, but in the end, Southern hard-liners clung to an increasingly incredible denial of their impending defeat and Northern radicals bent on vengeance made agreement impossible even at this late stage of the war. The author lays out this tragic and fascinating story in a style that is witty, acerbic and ironic. His characters stand out as strikingly distinctive individuals, including the bitter, delusional dead-ender Davis, a man "with a politeness so studied as to be almost sarcastic"; Secretary of War Edwin Stanton, with his "nerve-chilling stare and his perfumed beard"; and Stanton’s agent, the officious Maj. Thomas Eckert, who "descended from Washington City like the coming of the Lord." 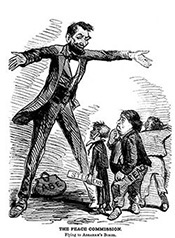 Towering over all is Lincoln, desperate to end the killing but, despite the fears of the radical Republicans, adamant about reunion and the end of slavery as the price of peace. A splendid addition to any Civil War library." "I suppose that it’s rare to begin a review with a disclosure—but in this case, it seems well worth mentioning that I began reading this book feeling an unusual common bond with author James B. Conroy. Both of us began our careers working on Capitol Hill for hard-driving liberal Democratic members of Congress from New York. At one point, our respective bosses even finished numbers one and two in a survey of the worst tempered officials in the House and Senate. And both of us turned, ultimately, to writing about Lincoln and the Civil War. I have tried to remain dispassionate about this shared professional arc, but I have to admit I began reading Conroy’s book feeling a sense of kinship. Although I’ve never met the fellow, I feel I’d like to, and assume we would have a grand time swapping stories not only about historical figures Alexander H. Stephens and Abraham Lincoln, but also about modern Congressional legends Bella Abzug and James Scheuer. "On May 13, 1865, John J. Williams, a handsome young private in the 34th Indiana Regiment Volunteer Infantry, was killed, along with an undetermined number of other Union soldiers, while fighting Confederate troops encamped near Brownsville, Texas. It’s called the Battle of Palmito Ranch, but it wasn’t much of a battle. It was a minor skirmish, and a pointless one: It took place more than a month after Lee surrendered to Grant at Appomattox, an event known to the combatants. Private Williams, the last casualty of the Civil War, died for nothing. But he wasn’t the only one. Each Memorial Day amid flag-waving, family picnics, and baseball, Americans come together to honor the dead—and the living—as a way of meeting a national desire that is more akin to a psychological need: assuring military families that their loved ones’ sacrifices were not in vain. Speaking on that hallowed day last month at Arlington National Cemetery, after returning from Afghanistan, our current commander-in-chief addressed this topic directly..."
" On Jan. 29, 1865, Captain Thomas Parker of Pennsylvania walked out into no-man's land along the Petersburg, siege lines. There, he met Lieutenant Colonel William Hatch of Kentucky. Both men were unarmed and under flags of truce. 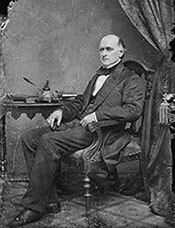 Hatch informed the dumbfounded Parker that three emissaries had just arrived from Richmond and wished to meet with President Abraham Lincoln to discuss terms for ending the war. Four days later, Lincoln, traveling alone, slipped into a carriage in front of the White House, bound for a fast steamer destined for Hampton Roads, at the mouth of the Chesapeake Bay. 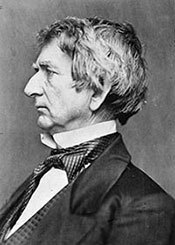 Only Secretary of State William Seward knew the purpose of Lincoln's clandestine sojourn. Thus began one of the most star-crossed secret missions of the Civil War, an audacious tale James B. Conroy tells with energy and eloquence. Conroy, a lawyer and former DC publicist and speechwriter, gives lie to the shibboleth that a thoroughly researched, abundantly footnoted, monograph can only be written in parched, overly academic jargon, by denizens of collegiate ivory towers. Our One Common Country swings out at a quick step pace with a narrative strategy that manages to incorporate a myriad of detail and analysis into a universe of uncommon suspense. It resonates with illustrative anecdotes, pithy turns-of-phrase, occasional hints of irony, andbon mons enough to fill a gossip column. It's a Civil War story that experts and novices will find riveting and revelatory. Conroy sets up his drama by giving readers incisive character portraits of the drama's leading players. His description of Greeley is as priceless as it is accurate: eccentric, fickle, and powerful all at the same time. Conroy conveys the essence of Ulysses S. Grant in two clear, concise, unpretentious paragraphs, a fitting tribute to the man himself. Conroy lets Confederate Vice President Alexander Stephens' own Shakespearian rhetoric eloquently invoke his startling image: "Weak and sickly I was sent into the world with a constitution barely able to sustain the vital functions.But all these are slight when compared with the pangs of an offended and wounded spirit." Conroy needs only seven choice words to bring Radical Republican Congressman Thaddeus Stevens to life: "Richard III in a Prince Albert suit." Because of the failure of the Hampton Roads Peace Conference, thousands of young men in blue and gray never had a chance to see their way at some future day." Gordon Berg is a past President and member of the Civil War Round Table of the District of Columbia (www.cwrtdc.org). His reviews and articles appear in the "Civil War Times and America's Civil War", among other publications. "Early on a winter morning in 1865, Abraham Lincoln exited the White House on a mission that only one of his staff or cabinet members, Secretary of State William Henry Seward, was aware of. An eight-hour boat trip down the Chesapeake Bay on the USS Thomas Collyer would deliver the President to Hampton Roads, Virginia, where he’d be the first, and last, U.S. president to carry on peace talks with the enemy in the midst of a war. The emaciated Lincoln was weary from his journey and said he’d meet the Confederate contingent the following day aboard the sidewheel steamer River Queen.